I bought this book today in the Hong Kong airport, on my way back to LA. Since I crossed the international dateline, it's still today for me, but it's already tomorrow in Hong Kong. Wow, I need some sleep! 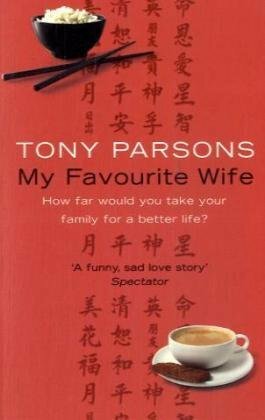 I read some previous books by Tony Parsons, like "Man and Boy" and "Man and Wife". Loved them both. This story is about a young couple and their young child who move as ex-pats to Shanghai. I've been there quite few times and can relate to their initial assessment of the city. It's quite impressive, especially at night, when the underbelly isn't quite as obvious. The beggars are very disconcerting, particularly the ones who are terribly deformed and incapacitated. It is also so incongruous with all the sky scrapers. Very glittery and beautiful at night, and the city is growing like crazy. So far, a good story (I started it on the plane). Will release it when I finish it, maybe a book ray... A wandering book -- the karma of literature! This was a great story, and very closely describes Shanghai and much of China as I have seen it. Tony Parson's male characters drive me absolutely crazy as they are usually so flawed and weak. The women are stronger and smarter. But I just want to punch the men! This was so interesting, and just recently in paperback, so I'm going to offer it as a book ring. Instructions: Please make a journal entry when you receive the book, and then also when you send it out so we know where it is and how you liked the story. Great story about life in Shanghai. This book is off by mail to continue the book ray. It's going now to Iagegu in the UK. Arrived today, thank you for posting it to me. I am in the middle of Jurassic Park at the moment by once I have finished that will get on with this. Have contacted MarcThomas for his address. MarcThomas not ready for book as requested he be put at the end of list. I will contact the next person. Seems nobody wants this book. I will now contact Purplerosebud. On it's way to Purplerosebud. Enjoy! Now arrived safely with me. I have one other book to finish first and then I can get started. I have enjoyed all the other books by Tony Parsons so I'm looking forward to reading this one. As expected I enjoyed reading this book. Once started Tony Parsons books grab me and keep me coming back frequently because I need to know what happens next. I liked the setting, I have been to China/Shanghai briefly so could picture the scenes quite well. I felt as if I was watching a film and wasn't sure how it was going to end. I am still wondering what happened to the characters Bill, Becca and Jin Jin after the final page. A couple of twists along the way that surprised me. Not a 9 for me but definately a good read. Thanks for sharing, I will be passing this on to Calalilly in a few days, weather permitting. Received from Purplerosebud today, unfortunately our weather had stopped us meeting up earlier. I've got another ring in front of this but it shouldn't be too lon before I start this. Another book from Tony Parsons that I really enjoyed. So easy to read. It did make me think about the poorer Chinese people and what their life must be like. Sending off to gringuitica in the next day or so. This book has been missing for a long time, so I'm picking up another copy to continue the ray. New copy now ready to travel by mail to daniellechonody in Texas. Enjoy!! I enjoyed learning more about Chinese culture. The book was pretty sad and the ending was too. Good characters and it keep you wondering where it was going. Received this book today and I hope to finish it this week. This book arrived back by mail today from MyssCyn. Sent off to valpete for her reading enjoyment, because it was on her wishlist and the book needed a new home! Thanks for thiking of me, Judy. I've never read this author - have "Man and Boy" on my TBR shelf, too. Hope to get to it soon! Sending this along as a trade with another BCer. Enjoy! to stand in the fireplace.